Chanel. Dior. Armani. Vera Wang. U.S. Postal Service? 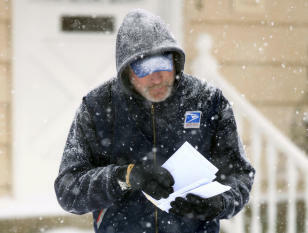 The cash-strapped Postal Service announced Tuesday that it has inked a licensing deal with an Ohio-based clothing company to produce a line of apparel dubbed “Rain Heat & Snow.” The attire aims to reach well beyond T-shirts and baseball caps to include “wearable electronics”—like jackets with iPod controls built into the sleeve, USPS spokesman Roy Betts explained to Yahoo News. “If you like your iPod, you can plug it right into your jacket, regulate the volume and make your selections right on your sleeve,” Betts said in a phone interview. There will also be shirts that help wick off sweat, he said. What about lingerie? Betts just laughed, so a racy line of USPS lacy unmentionables (perhaps dubbed "Saturday Deliveries"?) is probably not on its way. "For now, it’s all-weather, all-season clothing for men, ranging from headgear, footwear, jackets, coats and shirts," Betts explained. But they hope to launch a line for women. How will this help the financial bottom line at the post office, which recently announced it would halt Saturday deliveries? "It will make a contribution, but it's bigger than that," Betts said. “It’s really brand reputation, brand awareness, in addition to revenues. "We're a postal service that recognizes that our business model has to change, we’ve got to be more innovative with the products that we bring to market," the spokesman said. Will the clothing bear the post office logo? "I’m anxious to see it myself," Betts said cheerfully. "There will be something recognizable that identifies the product with the Postal Service." The post office is working with Cleveland-based Wahconah Group, Inc., a minority-owned company that designs, sources and manufactures clothing, according to a USPS press release. “The company is establishing a showroom in the garment district of New York City to showcase their apparel lines to the fashion industry,” according to the statement.